Pierre Boulez is arguably the most influential composer of the second half of the twentieth century. 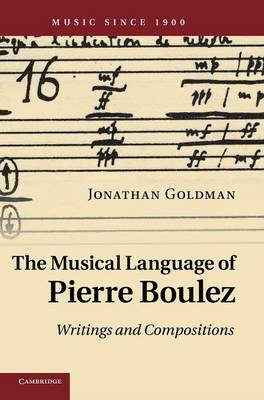 Here, Jonathan Goldman provides a fresh appraisal of the composer's music, demonstrating how understanding the evolution of Boulez's ideas on musical form is an important step towards evaluating his musical thought generally. The theme of form arising from a grammar of oppositions - the legacy of structuralism - serves as a common thread in Boulez's output, and testifies to the constancy of Boulez's thought over and above his several notable aesthetic and stylistic changes. This book lends a voice to the musical works by using the writings - particularly the mostly untranslated collected College de France lectures (1976-95) - to comment on them. It also uses five musical works from the post-1975 period to exemplify concepts developed in Boulez's writings, presenting a vivid portrait of Boulez's extremely varied production.